True Justice Season 2: Blood Alley DVD Review I'm not sure how much this is going to retail for, but if it's cheap; go for it. It's certainly worth renting out for a quick entertainment fix. It's a shame there are no extras here, simply the word PLAY on the home menu, but there might not have been a budget for that. 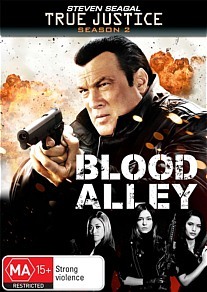 Steven Seagal returns in this instalment of True Justice as special forces operative Elijah Kane who is roped into getting his team to look at a series of abductions involving human organ trafficking. This is a direct to video affair, albeit a slightly higher quality affair than one would expect with a fairly decent roster of B grade actors gracing the screen in a story that holds together fairly well. There isn't a great deal to go on about the story, it doesn't run long, the premise is simple and as long as you know you are just watching for a bit of fun you should be just fine. The most striking thing I noted watching this is simply how different Seagal looks from how I last saw him in anything movie or TV wise. He's certainly aged a fair bit and considering how clear the video quality is in this, you can almost make out the boot polish in his hair, it is soooooooo unnaturally black. Add to that a paunch, and possibly they should have simply nodded to his years and played him in that role. Instead you have young women interested in him and calling him handsome, sorry it just doesn't ring true. The quality of this show in terms of video is solid. Scenes are shot well and image is vivid throughout. Editing is very tight and makes the most of just how short the feature is. The soundtrack also suits the scenes and is well scored. All things said and done this is a well put together product, it just feels a bit simple at times and I struggled with really getting immersed in it due to the story running along at the brisk rate it does. I did notice on occasion the audio suffered a bit when there was dialogue. Never enough to miss any words but enough to stand out from the rest of the audio. All other sounds, weapons and environmental were well recorded and played back well. Although in 5.1 audio, I didn't really notice a great use of surround, nor did it really need it. I'm not sure how much this is going to retail for, but if it's cheap; go for it. It's certainly worth renting out for a quick entertainment fix. It's a shame there are no extras here, simply the word PLAY on the home menu, but there might not have been a budget for that. Save this one for a rainy day or a cheap present.